Players can play as a Wizard, Warlock, Beastmaster or Priestess; each with their own unique strategies and style of play. The game is fast-paced and exciting, with tough tactical decisions every turn. Players build their own custom spellbook, with over 300 spells to choose from! The game is not collectible – players have equal access to the same spells. There is no random card drawing – players choose exactly which spells to cast, when they want to cast them! This allows for an unprecedented level of rich strategy and tactics. Summon powerful creatures into the battle, hurl lightning bolts and fireballs, adorn yourself with mighty weapons and armor, or lay a network of hidden enchantments to take your foe by surprise. 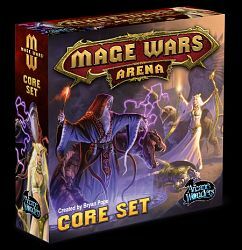 All of this and more awaits you in the arena of Mage Wars! With subtle strategies and diabolical surprises, the balance of power can shift each round, keeping the game exciting and victory unpredictable. Future expansions will offer new mages, spells, and strategies! Very important: Mage Wars is customizable, but not collectible. Everything you need to play is in the box, and players can carefully choose just the expansions they want.